So, I wouldn’t normally recommend battery apps be downloaded on an Android phone; alongside task manager apps these are probably the worst apps available on the Play Store. If it was that simple to increase battery life and improve performance, Android would have already implemented it. The only sure-fire way to improve battery life on Android is by turning off features (Wi-Fi, Location, Bluetooth etc.) or uninstalling an app that is causing excessive battery drain. So, how is AccuBattery different? Well, for starters it doesn’t claim to improve your battery life, it just gives you a better picture of your usage. 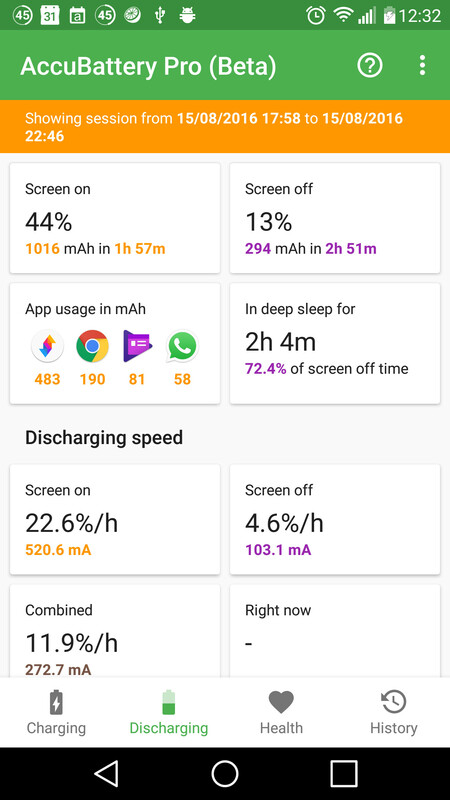 Android has a built-in battery usage section, but AccuBattery goes further and breaks down your usage into sections like “Screen On”, “Screen Off”, “Per App Usage” and “in Deep Sleep”. Screen On – shows how much battery has been consumed with the screen on. Screen Off – how much battery has been consumed with the screen off. Per app usage – breaks down the battery usage by app, so you can see which one is using the most. “Screen On” and “Screen Off” are pretty self-explanatory, just bear in mind that your screen is probably the biggest battery-sucker that your handset has. For example, 3 hours of screen on time used as much battery as 14.5 hours of screen off time on my Nexus 5X! Deep Sleep is a power saving mode built in to all Android handsets; different phones will go into Deep Sleep after different periods of time. The important thing is that the device stays in Deep Sleep until you wake it. The higher the percentage of time the app has been in Deep Sleep, the better. So if you are having battery issues on your Android smartphone, install this, leave it a few days and then have a look at the figures; it may help to realise what’s causing your battery woes.